Product prices and availability are accurate as of 2019-04-11 12:48:16 EDT and are subject to change. Any price and availability information displayed on http://www.amazon.com/ at the time of purchase will apply to the purchase of this product. New! H&R Block TaxCut Premium Federal has everything you need in one comprehensive program for any tax situation, from 1040EZ to Schedule C. Step-by-step interviews provide guidance customized to your unique needs. 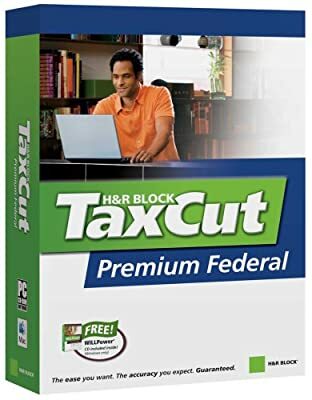 H&R Block TaxCut Premium Federal has everything you need in one comprehensive program for any tax situation, from 1040EZ to Schedule C. Step-by-step interviews provide guidance customized to your unique needs. H&R Block TaxCut: The ease you want. The accuracy you expect. Guaranteed. Find every feature and form from last year's Deluxe and Premium in just one program, and let TaxCut seamlessly import your data from last year's TaxCut or TurboTax, as well as Quicken, and Microsoft Money. Make the most of money-saving deductions. Receive guidance on claiming dependents, taking a home office deduction, and much more. Save money with useful tips covering charitable donations, rentals, dividends, interest, capital gains, and more. TaxCut is the only do-it-yourself tax program backed by the experienced tax professionals at H&R Block, America's largest tax services company. Includes complimentary copy of WILLPower software with valuable estate planning guidance and legal documents. Make sense of changing tax laws and achieve maximum deductions. Included with any federal TaxCut Software purchase. Kiplinger's Tax and Financial Planning Library Make the most of your money with tax and financial information. View the most up-to-date IRS publications. Extra help with depreciation, business expenses and home deductions. Quickly determine the true cost basis for stocks, bonds, or mutual funds and tax consequences associated with company incentives and employee stock. Assistance with mortgage deductions and capital gains tax liability when selling a home. An H&R Block Enrolled Agent guides you through what to expect during the audit, attends the audit with you and helps you manage the entire audit experience. Rest easy knowing H&R Block is there to help in the event of an audit. From outlining what to expect and providing guidance on how to prepare for an audit, to having an H&R Block Enrolled Agent represent you before the IRS upon your request, H&R Block can help you manage the process. 1. Successfully e-file* your individual resident income tax return (federal or state) using TaxCut or TaxCut Online (with paid federal return) and you are eligible to receive audit support at no additional charge for your 2005 return. 2. Retain your e-file confirmation email for Worry-free Audit Support confirmation. 4. Call 1-800-HRBLOCK to initiate audit services that you may need. Conditions apply. View the complete terms and conditions for details. Q. Can I do my taxes by hand and then sign up for Worry-free Audit Support? A. No. H&R Block Worry-free Audit Support is only offered for returns e-filed with an H&R Block Digital Tax Product. Q. Who will benefit using Worry-free Audit Support? A. Those clients who want no surprises after filing their taxes. It's a smart way to make sure you're covered no matter how complex your tax situation. The benefits of Worry-free Audit Support will be invaluable in the event that you need representation because the IRS questions your tax return. A. Enrolled Agents are tax professionals who have demonstrated special competence in tax matters and can represent taxpayers before the IRS. Enrolled Agents do not provide legal representation, signed Power of Attorney required. Void where prohibited. Q. What are the services offered with Worry-free Audit Support? * Enrolled Agents do not provide legal representation, signed Power of Attorney required. Void where prohibited.